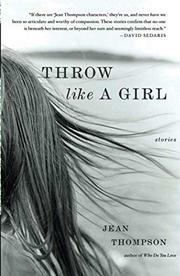 In her fourth collection of gritty, grueling stories, the Illinois author (City Boy, 2004, etc.) emerges as something very like America’s Alice Munro. Lives of girls and women (an early Munro title) are Thompson’s province. Its occupants include the high-school misfit (“The Brat”) whose defensive friendship with an obese, resentful classmate nurtures the kind of paranoid rage that erupts all too often in school shootings; a suburban mom (“The Woman Taken in Adultery”) whose willful quest for freedom only confirms the limits that constrain her; and the deeply conventional Iowa widow whose commitment to housewifely routine (“Pie of the Month”) ultimately cannot distance her from a world at war and threatened by ongoing radical change. Each of the 12 stories is precisely fashioned, distinguished by complex and unsparing characterizations and studded with metaphors made from the stuff of everyday life (“You never got to the place where you could stand back and admire your happiness like it was a picture on the wall”) and wry acknowledgements of the sheer drudgery of living (“You’re supposed to say the years flew by without your noticing but…I felt their shape and weight at every step”). Even when not at her best, as in a somewhat unfocused glimpse of a woman’s flight to Alaska from the married lover whom she nevertheless cannot forget (“The Inside Passage”), or the title story’s mixed-emotions memory of a female friend who succumbs to alcoholism and cancer, the tangle of these stories’ relationships, and their narrators’ urgent insistence to understand themselves and to be understood, is compelling. And in two great stories—a wrenching anatomy of infidelity and remarriage (“A Normal Life”) that memorably dramatizes the biblical parable that we reap what we sow, and a hilariously moving account of a middleclass clan (“The Family Barcus”) malformed and traumatized by its Babbitt-like dad—Thompson rivals Munro at her greatest. One of the best contemporary short-story writers in peak form.